The occasion was marked by an Entered Apprentice Degree being carried out by Brother Andrew A. McKinnon and Office-bearers of the Province of Stirlingshire. During the ceremonial Brother Ronald Hay PM Lodge Ladywell No1474 was made an Honorary Provincial Grand Junior Deacon by Brother McKinnon. Brother McKinnon was himself surprised to be made an Honorary Life Member of Lodge Ladywell No 1474. An Anniversary Dinner was held in the Lodge room after the Meeting. 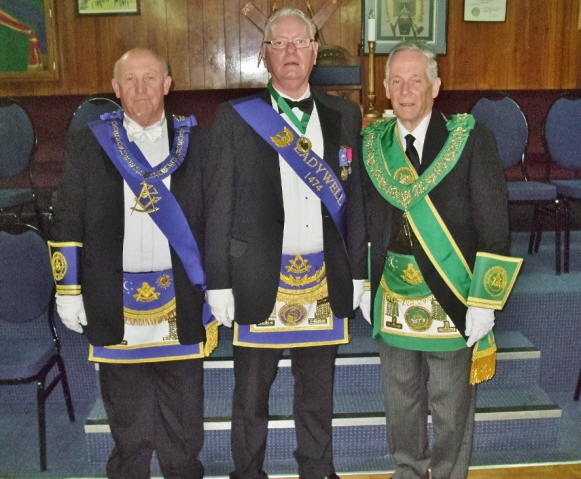 The picture below shows Brother Ronald Hay flanked by Brother McKinnon and Brother Ian Taylor RWM.